Procedural fairness is a topic of contemporary importance that touches upon the jurisdictional powers, effectiveness and normative and institutional framework of international courts and tribunals. Increasingly prominent in practice, it features in a wide spectrum of the arbitral and judicial settlement processes, from the handling of expert evidence before the International Court of Justice and the burden and standard of proof in investor-State arbitration to the role of victims and right to a prompt and speedy trial at the International Criminal Court. The fairness of these proceedings, therefore, is a topic of fundamental importance not only to practitioners of international law (judges, counsels, registrars, NGO lawyers, legal advisers and other civil servants) but also to scholars of international law due to its implications for the key topic of international dispute settlement. 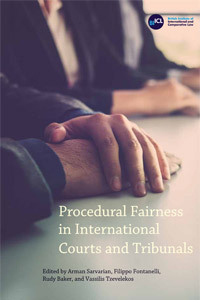 This book frames the study of procedural fairness as the identification of fundamental principles inherent to international judicial and arbitral processes. It draws together a number of pertinent issues on specific aspects of fairness (e.g. the equality of arms principle) before international courts and tribunals within a comprehensive narrative. The book brings academics and practitioners together to initiate ground-breaking research into this novel topic. It employs a comparative approach whereby contributors analyse the procedures and practices of various international courts and tribunals. It identifies patterns of commonality and divergence in the core standards of procedural fairness of international courts and develops a holistic understanding of the nature of procedural fairness and the challenges to its realisation in the international judicial system. The book concludes that, while there is no universal model of procedural fairness, nascent principles of fairness are emerging in the jurisprudence of international courts in order to resolve procedural and practical issues. Contributors: Dr Paolo Busco, Judge Sir Kenneth Keith, Dr John Sorabji, Dr Gabriele Ruscalla, Dr Serena Forlati, Mr Raymundo Tullio Treves, Dr M I Fedorova, Dr James Devaney, Ms Catherine H Gibson, Dr Chiara Giogetti, Professor Hugh Thirlway, Brooks Daly, Hugh Meighen, Professor Chi Carmody, Oonagh Sands, Advocate General Juliane Kokott, Wolfgang Rosch, Dr Lucas Lixinski, Judge Philip Weiner, Dr Sergey Vasiliev. "Procedural Fairness in International Courts"